While you should reasonably be able to expect your breast implants to last for many years, it’s important to understand that they are not intended to last for the rest of your life. Like all medical devices, breast implants will eventually wear out and require a revision procedure to replace them. The good news is that you will not be undergoing breast augmentation on a regular basis. As long as you’re still happy with your results and there is no evidence of rupture or other complications, there will be no reason to replace your breast implants. Most women can expect their implants to last 10-15 years or longer. However, you should expect that at some point down the road, you will most likely require a procedure to exchange your breast implants for a new pair. Whether you’d like to replace your breast implants for aesthetic reasons or due to a rupture, Dr. Richard Lee can help. Dr. Lee is a board-certified plastic surgeon with over a decade of experience performing breast augmentation revision procedures. He will work with you to develop a customized treatment plan that will address your unique needs and goals. You can learn about your options and receive individualized treatment recommendations by speaking with Dr. Lee in person. Please call 949-548-9312 today to schedule your free consultation. We serve patients in Newport Beach and throughout Orange County, California. Dissatisfaction with your breast appearance – This can occur for a variety of reasons. Some women were never happy with the cosmetic outcome of their breast augmentation procedure. Others find that their breast appearance has changed over time due to aging, pregnancy or weight fluctuations. Interference with physical activity – Very large breasts can potentially make it challenging to live an active, athletic lifestyle. They can impact the range of motion of your arms during athletic activities. In addition, the extra weight in your breasts can pose challenges when running. In some instances, this additional weight can also cause back or neck pain. Changes in style over time – Body trends change over time. A look that was considered desirable and attractive 10 years ago may not be in style today. While very large implants were popular in the 90s, today many women are choosing a more moderate breast size when they undergo breast enhancement. Many women choose to undergo a revision procedure in order to ensure their appearance reflects the current styles and trends. Desire for a different sized implant – It can sometimes be difficult to envision how your new breasts will look before you undergo breast augmentation. If you feel that your initial implant was either too large or too small, you can exchange them for a size that is more appropriate for your frame. Desire to switch from saline to silicone breast implants – There was a 14-year period where silicone implants were banned by the FDA. Advances in silicone breast implant technology, along with extensive testing regarding the safety of these devices, led the FDA to reverse this ban. Today’s silicone implants are extremely safe, and they usually look and feel more natural. Many women with saline implants choose to replace them with silicone implants in order to achieve a better cosmetic outcome. 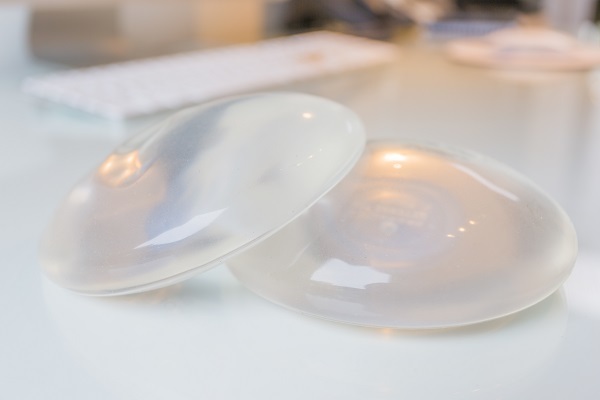 The silicone shells used with breast implants are very durable; however, there is still the possibility that they may rupture. In general, rupture rates tend to increase 1% per year, so the risk of rupture remains relatively small even after a decade. When a saline breast implant ruptures, the sterile saline solution filler will escape from the shell, resulting in a deflated breast appearance. This doesn’t present any danger to you since the saline solution is safely absorbed and eliminated by your body. However, you will want to replace the ruptured implant at your convenience in order to restore a more symmetrical breast appearance. Modern silicone implants use a cohesive, form-stable material which will remain in the shell after a rupture. As a result, you typically will not be able to notice when a rupture occurs to a silicone breast implant. For this reason, the FDA recommends that you undergo periodic MRIs to ensure that the implant shell hasn’t ruptured. After extensive clinical studies, the FDA has determined that there is no danger to you in the event that a silicone implant ruptures. Since your breast appearance will remain intact due to the form-stable silicone gel material, you can remove and replace the ruptured implant at your convenience. Breast augmentation complications are extremely rare when you work with a highly skilled and experienced board-certified plastic surgeon. However, all surgical procedures are associated with some degree of risk and breast augmentation is no exception. In the event of a complication, you may require a revision procedure to correct the poor outcome. Capsular contracture – This condition occurs when a thick capsule or layer of scar tissue forms around the breast implant, causing it to feel firm and uncomfortable. Rippling – This condition results in visible ripples or folds to your breast implants. Saline implants and very large implant sizes pose the greatest risk of rippling. Implant malposition – Implants can fall out of position in several ways. They can fall out to the side (lateral displacement), sit too low (bottoming out), sit too high or rest too close together (symmastia). Often, symmastia can result in a “uniboob” appearance. “Double bubble” – This occurs when the lower round implant edge becomes visible behind the breast fold, creating the appearance of a double crease. During your consultation, Dr. Lee will discuss the specifics of your procedure in greater detail after he has evaluated the condition of your breasts and your reasons for undergoing a revision procedure. Please contact Dr. Richard Lee using the form on this page or call 949-548-9312 today to schedule your free breast augmentation revision consultation. We serve patients in Newport Beach, Irvine, Santa Ana and throughout Orange County, California.